Learning How to Learn and Achieving Success..
Increase their concentration level by learning how to identify, analyze and reduce distractions – a key method for improving concentration. Learn effective time planning strategies by understanding what to do, when and how to organize their schedules by prioritizing what is important. Understand how to prepare for exams by identifying useful strategies that will allow students to plan their study time and organize the studying. Learn the crucial significance of effective time management and also how to monitor, analyze and revise their schedules to incorporate new deadlines and projects. Increase understanding in class, take objective notes in class and keep distractions to the minimum. 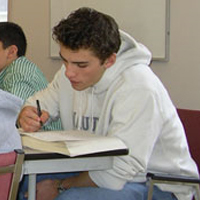 We teach students "how" to succeed academically and strengthen their confidence in themselves.